Well, those famous big fish northern Kola rivers have been opening their seasons in Russia. The Yokanga, for example, is nearing the end of its first week. And it makes you realise how different the fishing is there to the Varzuga. Not as many fish, not nearly as many. But bigger, much bigger! I was talking to Henry Mountain this morning whose own “salmon adventure” operation, Fly Fisher Travel, has rods out there at the moment. A 33-pounder (nice), a 24-pounder, by Matt Harris (nice) and several other big fish (all very nice). But not that many of them. Apparently storms at sea that are silting up coastal waters and gales so strong (that’s the way of gales) that you can hardly fish in them could be to blame. And some quite low temperatures, lower than we had a month ago on Varzuga (when the water was as warm as 12 deg C at times). Still the 14 Yokanga rods each day are taking 10 or so fish so not bad.. The Kharlovka, too is suffering from the above conditions, but again these things are relative. The Gaula? Still a bit of a yo-yo of river levels but good numbers of stunning, big salmon are coming from the ‘E’ beats of the Norwegian Flyfishers’ Club waters. When those fish move upriver the fireworks will start in earnest. There’s the first 2010 video up on the website now, http://www.nfc-online.com and it’s worth a look: a tale of two fish, both now on their way up the river. 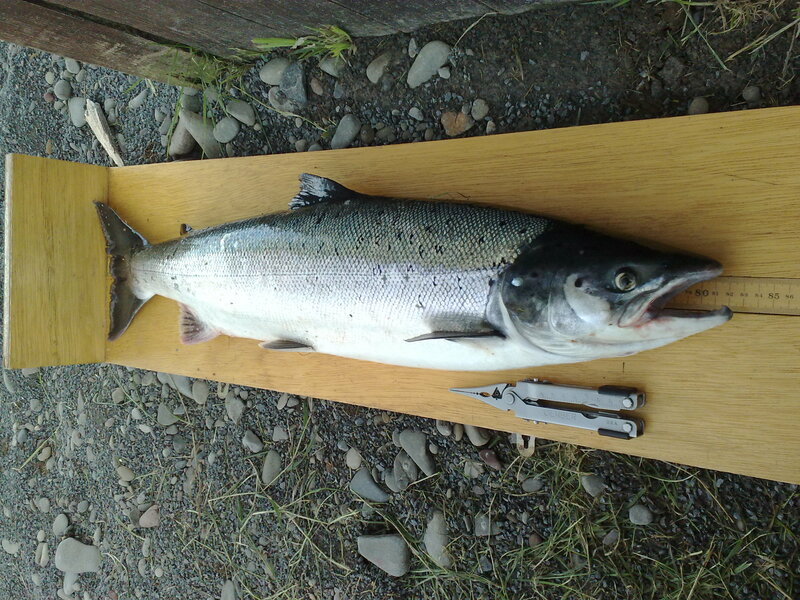 My father's first salmon: 12.5 lb, from the Nith last year after a wee summer spate. Another of these would do nicely. Phew, I got another salmon picture in, about time too. It’s my dad’s first salmon which he caught on a small Rapala last summer. The water boiled. We’ll be up there again next month and will be looking to repeat the experience, maybe on the fly rod, with some of the famous Nith sea-trout thrown in that apparently are staging a come-back this season. I can’t wait.